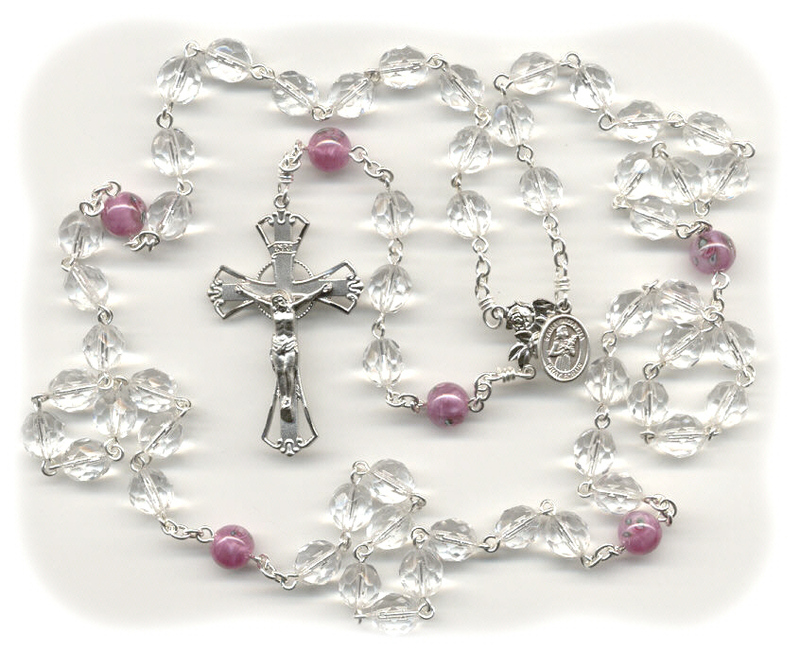 This is my handmade clear Czech glass breast cancer rosary with pink Paters featuring the most awesome St. Agatha. To learn more about why cancer rosaries are such an important ministry to me, check out my blog by clicking HERE. Unlike other cancer rosaries, this one is fully customizable, and includes specially engraved parts customized to help raise money for cancer research. All of my cancer rosaries are ~made to order~, so please allow an extra day or two for completion before shipping. And remember....every full-sized, hand made, Speziale rosary also comes with a special prayer card and a drawstring pouch for easy storage. HOPE: The bright silver plate finish on all of the parts is a symbol for hope! I can’t stress enough how important a hopeful and positive attitude is for someone who is sick. It can mean the difference between life and death. PRAYER: The crucifix has the words Pray for a Cure on the back as a reminder pray, pray, pray. Pray for a cure. Pray for whatever is best for those involved. Pray for the researchers and drug companies so that they keep on track and disregard that nagging greed. SUPPORT:The center features two roses which symbolize Our Lady. Mother Mary can be a HUGE member of our support team if we let Her!! She is a reminder of our compassionate and nurturing natures. REMEMBRANCE:The word Remember is engraved on the back as a reminder: Don't EVER forget the sick or the souls of those who have passed. They still need our prayers! SAINTS: The charm attached to the center is of St. Agatha who is the patron saint of Breast Cancer. Click here for more information on this amazing woman!The saints are an important resource for us, especially when times get rough. This is the only part with an oxidized finish on it (it was necessary to show the detail of the medal).